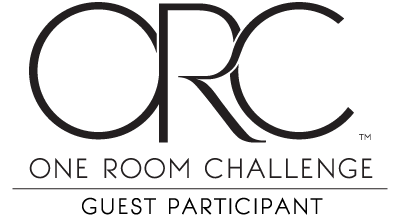 I am so excited to participate in the Spring 2019 One Room Challenge in conjunction with their official media partner Better Homes and Gardens #bhgorc. 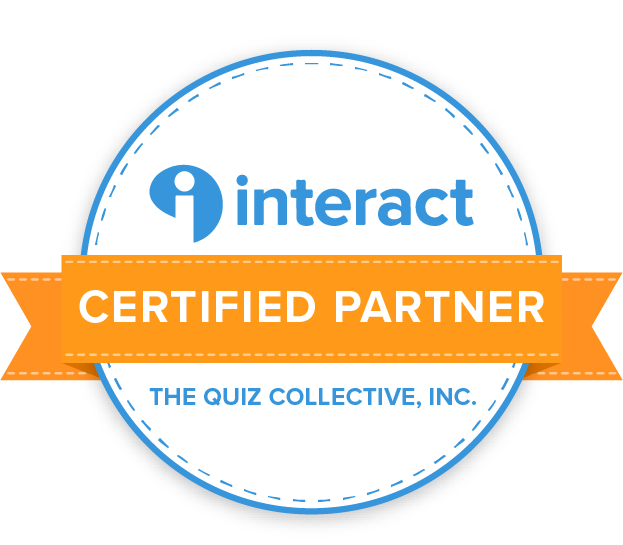 I have seen others transform rooms and support each other during past challenges and I have loved the dedication, creativity and support of the participants. My life outside of design consists of caring for and keeping up with three active little girls. The two youngest little ones are ages 3 and 4 years old. 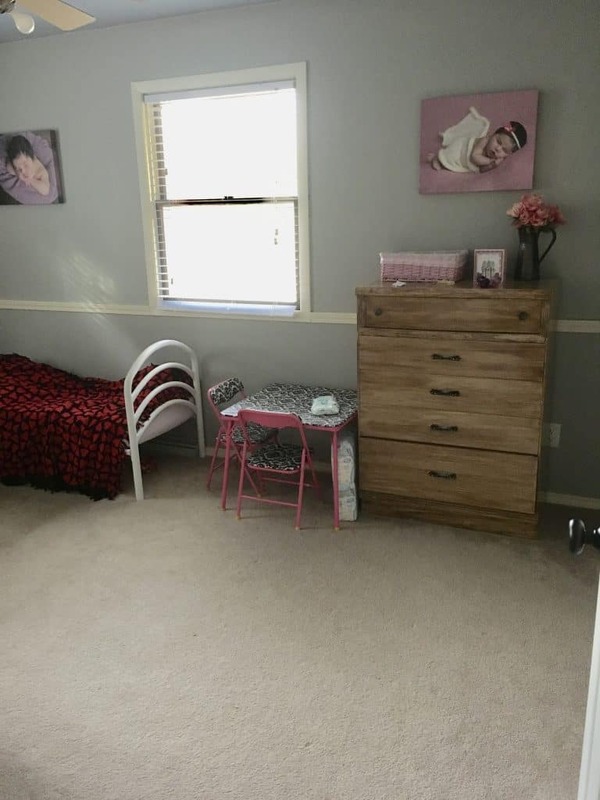 Since the youngest is now going to be in a big girl bed, I am very excited to transition the room into a shared girls bedroom that allows them the space to be happy and comfortable. They are a duo to be reckoned with and I hope their room will reflect their energy, cuteness and potential. Here is the mood board created for their room. The major changes to the room are the wall paint color, adding wallpaper (Livette’s Wallpaper), new trim and new windows (Renewal by Anderson). Two new beds, nightstand, dresser, rug, art and accessories will be special additions to the room as well. 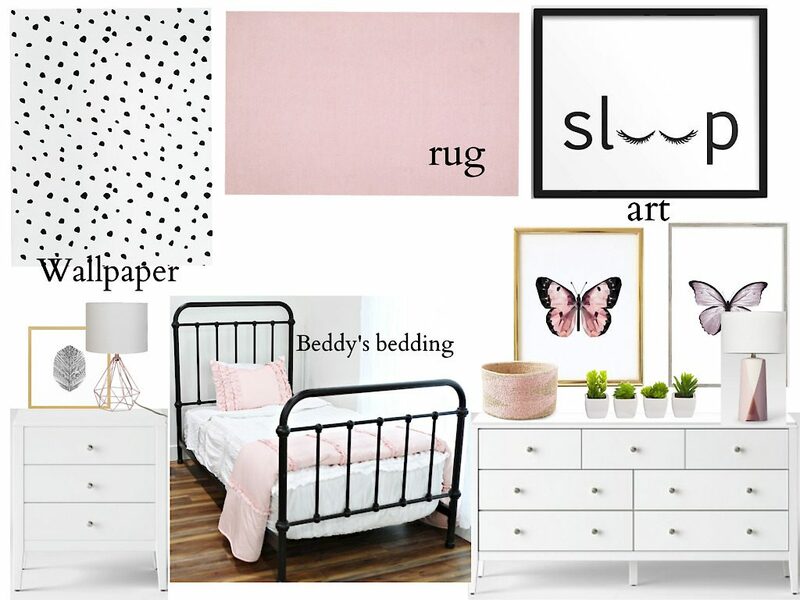 I started with a love for the Beddy’s bedding and certain colors I wanted to incorporate: black and white, pink and purple. The butterfly art is girly and cute, but the art represents so much more. My girls are still like small caterpillars, but I hope through nurture, they will transform into beautiful butterflies. This room will be a cocoon from the world, where they can be safe to grow. In my book, Making Room: How to Create Soul and Style in Your Home, I explain how many of our design decisions can be led by our stories past, present and future. I want to tell a story through the art and the overall design. Below is a photo that has inspired some of the bedroom design. 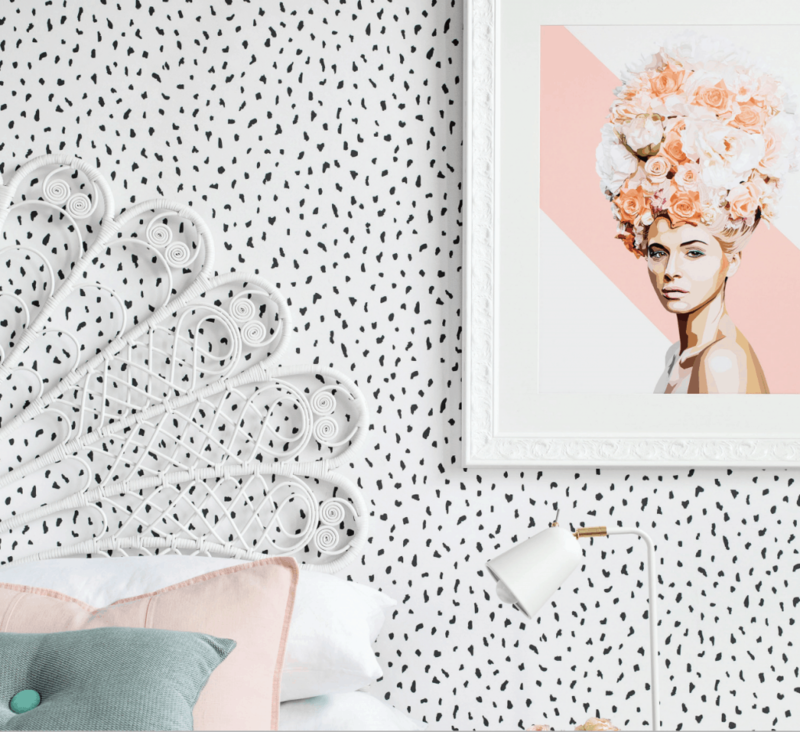 The black and white wallpaper brings energy to the room, which my girls have an overabundance of and the pink is feminine and soft. I love the white on white and the pops of color. Here are some before photos of the room so you can appreciate the transformation more and see the progress. All of the furniture that you see in the room is already thrown away or put into another space. 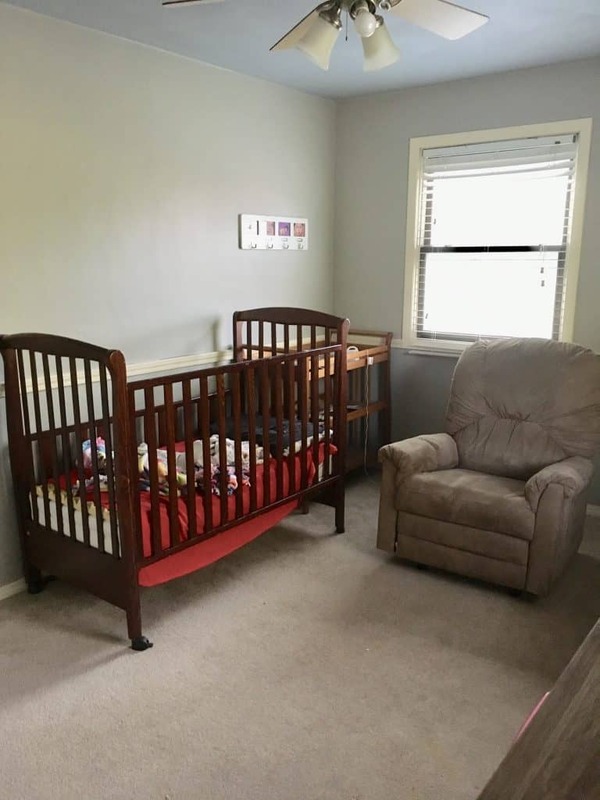 Their room has been functional, but certainly not pretty or stylish. The first week has been all about clearing the space, removing all the trim and preparing it for new paint. I am so excited to create a space that my girls feel special in and offers them some personal space, even though they are going to be in the same room. Because we have plenty of space in the basement for toys and books, I will not be accommodating them in the room. Their room will be mostly for sleep, getting read to before bed and eventually for personal, quiet time. Right now I can’t trust them to nap in the same room because they keep each other up and find mischief, but as they get older, I imagine them sitting on their beds to relax with a good book or write in their journals. Thanks for checking out the plan. I hope you will follow along with my journey. Each week for six weeks, I will post the work progress and eventually the final reveal. See more about the project on Instagram @lucyjohome.